The Obama Foundation has publicly released all Requests for Proposals (RFPs) and Requests for Quotes (RFQs) solicited in 2014 during the Foundation’s location search for the future Obama Presidential Center (OPC). The documents were released 12 days before the full City Council will vote on an ordinance “concerning the residential workers community benefits agreement,” a proposal with the intent of giving the city the ability to evaluate and respond to drastic demographic changes caused by economic activity surrounding the Center. About Washington Park, the report concluded, “Of all the proposed sites, this one would be most amenable to accommodate new businesses and investment that might come into the area due to the presence of a presidential library.” The area surrounding Washington Park was assessed as the least developed, most accessible by public transportation, and the most likely to see new businesses move into the area. The evaluation of Jackson Park rated the location less favorable economically but noted it would provide the University of Chicago greater control over the area’s development. 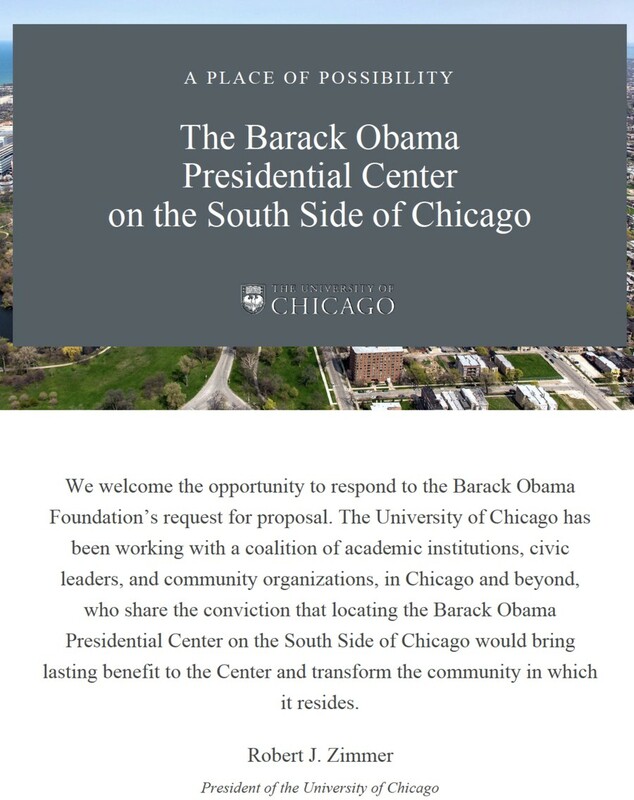 Obama Presidential Center critics and community members have argued that the University has played a disproportionately large role in the Center’s planning. Talks of Washington Park as a more suitable location for the Center have widely circulated during the Center’s planning. Last January, nearly 200 University of Chicago faculty members signed a letter calling for relocation of the Center, many suggesting Washington Park as a superior alternative. The Foundation’s decision to release the documents comes after increased pressure for transparency from community groups, including a lawsuit against the Chicago Park District and City of Chicago filed by Chicago community organization Protect Our Parks. University of Chicago Sidley Austin Professor of Law Lior J. Strahilevitz said, “As best I can tell, none of those [RFP and RFQ] releases are relevant to the issues in the Protect Our Parks lawsuit.” Strahilevitz recently wrote a commentary article for the Chicago Tribune discussing the OPC’s likely approval and advantage in court of law over community organizations fighting for relocation. “In recent decades there have been several important cases where the Illinois courts have developed the law with regard to what can and cannot be built on the Chicago lakefront. Those binding legal precedents very strongly favor the OPC’s legal position in this case,” Strahilevitz said.